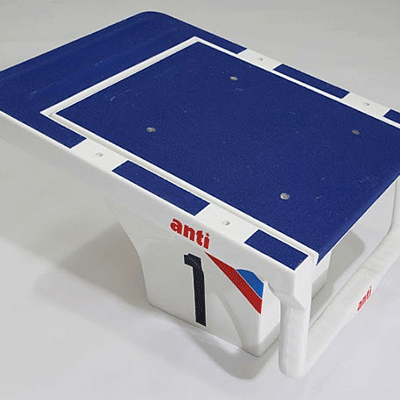 The Anti Super Starting Block 400 is the cornerstone of our racing platform line. The Anti Wave Super Starting Block is the premium starting block for major competitions and combines performance with unbeatable value. Designed with close consultation with a number of professional swimmers and coaches throughout Australia. Produced in the UK from top-quality materials including rugged, hand-laid fibreglass and SS316 fittings. Starting Block suitable for sound and timing systems. Kwikstart handles have been specially designed in collaboration with Team Australia to improve start times and are available as an option on this starting block.